PNNL is a world-recognized leader in energy storage innovation through its expertise in chemistry, materials, design, and technology transfer to the private sector. Large-scale energy storage is key to integrating renewable resources into the power grid, thus enhancing the grid’s reliability and resiliency. An organic molecule used in dyes and antibiotics may be the key to less expensive, more efficient redox flow batteries. Scientists at the Pacific Northwest National Laboratory developed a highly reversible, water-soluble material based on phenazine. The compound could serve as an alternative to vanadium, which is used in grid-scale batteries to store electricity. 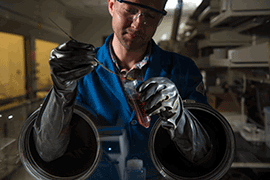 PNNL researchers developed the material to reduce the cost of redox flow batteries. Currently, many commercial redox flow batteries use a vanadium-based electrolyte. Vanadium is primarily used in steel making and for commodity materials, and its costs can vary based on supply and demand. To overcome cost constraints that occur when demand is high, PNNL scientists developed the new phenazine-based material as an alternative to vanadium as described in the June 4, 2018 issue of Nature Energy. This development is significant because scientists have long found it challenging to get organic materials to dissolve in water while maintaining the desired electrochemical properties. The PNNL research team, led by chief scientist Wei Wang, knew that phenazine—a naturally occurring compound—possesses the needed redox reactions, but was not water soluble. So, PNNL researchers developed a method of chemically modifying phenazine, producing a water-soluble derivative that also optimizes its redox properties. When dissolved in the electrolyte solution, the team found 90 percent of the dissolved phenazine was available to carry energy. According to Wang, modifying the phenazine is straightforward and scalable. While the team still needs to conduct a cost analysis, phenazine precursor chemicals are readily available and inexpensive. PNNL will continue testing a phenazine-based anolyte (negative electrolyte) and plans to develop a corresponding catholyte (positive electrolyte). Combined, the solutions could lead to a new type of redox flow battery. The work was funded by the DOE's Office of Electricity with nuclear magnetic measurements and theoretical calculations performed at the Environmental Molecular Sciences Laboratory, a DOE Office of Science User Facility operated by PNNL. PNNL Research Team: Wei Wang, Aaron Hollas, Vince Sprenkle, Vijayakumar Murugesan, Zimin Nie, Bin Li, David Reed, Jun Liu, and former staff member Xiaoliang Wei.